A multiday tour is an engagement spanning several days. Of course anyone can show you around for a day or two. However, lacking the essential personal and communicative rapport and deep supporting narrative, things could get repetitive and tedious quickly. Let me assure you, that will not be the case when you sign me up to be your local guide and host for several days. I spend a significant amount of my time training to provide this service and I am very proud that a large number of my former clients are satisfied multiday customers. I am constantly investigating, exploring and organizing cogent information into an seamless grand cultural and historic narrative covering the Pearl River Delta Region. The results of my efforts are demonstrated by the range of information I share with my clients as my tour repertoire continuously evolves and expands. When I organize your multiday tour experience, I will do so in a manner that fully integrates your itinerary with my grand narrative. 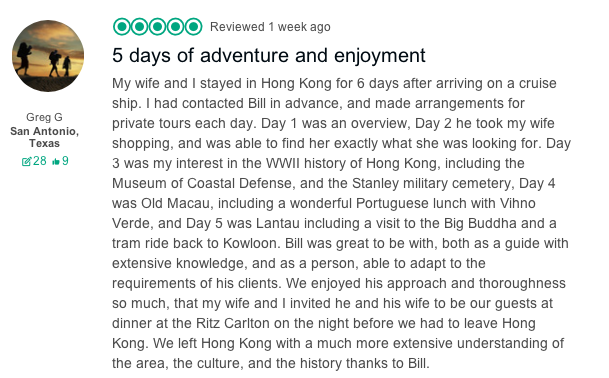 In preparation for your multiday tour outings of Hong Kong and environs, I welcome detailed written inquiries and the correspondence that often follows. By means of the lost art of letter writing, you will have an opportunity to get to know me and how I intend to serve you. And please do read my reviews carefully. They are the best indicator of the depth and quality of the experience I offer. Day 1: Private Walking Tour of Kowloon and Hong Kong Island (expandable into 2 days). Hong Kong Island was the center of Hong Kong the British Colony. Kowloon, however, was the economic center of gravity of Hong Kong in the modern era following World War 2. 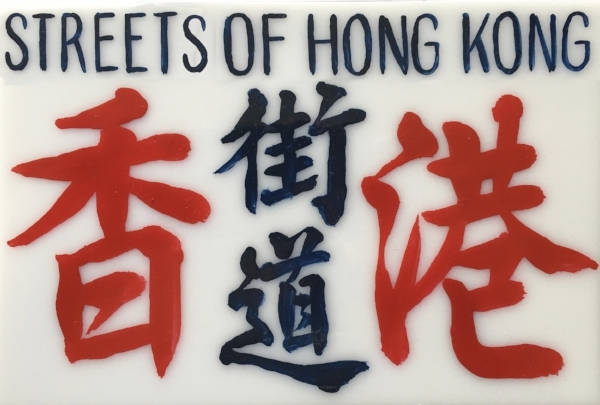 It is where most of the Mainland Chinese refugees settled, where all the factories that made everything we wore in the 60s and 70s were concentrated (remember Huk-A-Poo Shirts, Jordache Jeans and Members Only jackets?) and where all the old Cantonese style urban neighborhoods have hung on, purely by accident of history (i.e., they were all located in the landing approach of the old Kai Tak Airport). It is also a place with history dating back to the Song Dynasty in the 13th century. Day 2: Private Tour of Lantau Island Including Tai O and the Giant Buddha. I take my clients to see the spectacular Big Buddha and the Nong Ping 360 cable car, but to me the main attraction of Lantau Island is Tai O fishing village. This is not a hidden gem. This place is a gem. Here, with some imagination applied, you can get a fascinating glimpse of how the Tanka fisher folk lived in the Pearl River Estuary before the "foreign barbarians" arrived. Indeed, the place was also a nest of piracy. And the scenery is visually stunning! It is a bit disconcerting because if you arrive there after 12 noon, it is packed with tourists. Without them, the place could no longer survive. So the name of the game is go there first and get there early, before the pink dolphins make their retreat from the crowds. Day 3: Private Walking Tour of Old Macau. The Portuguese arrived in the Pearl River Delta region over 400 years ago. Macau was established 300 years ahead of Hong Kong. I call it a Little Lisbon on the South China Coast. The center of the old city is one big World heritage site. Forget about the casinos which are in another direction. Macau is like going into a 60s time warp. Day 4: Other Private Hong Kong Tours--for example: Maritime History of Hong Kong; Cheung Chau Island, Battle of Hong Kong, New Territories, Eastern and Southern Districts, Shopping Tour, Sheung Wan and the Western District, Kowloon City District and Kowloon Walled City Park, Old Sham Shui Po and Yau Ma Tei by day (Yau Ma Tei is where the Temple Street Night Market is located and is very different during the day. A truly authentic old Chinese neighborhood). 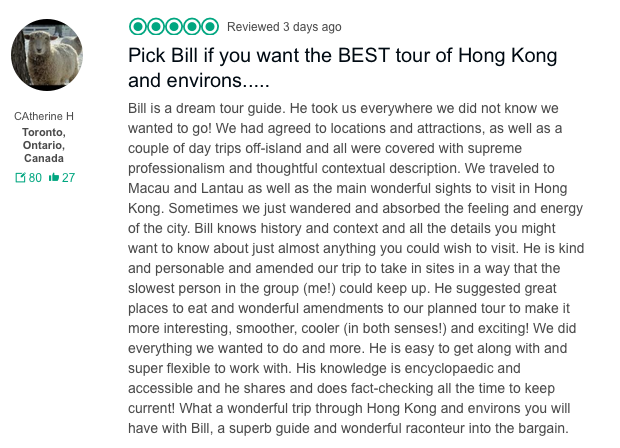 I AM HAPPY TO PROVIDE A DETAILED MULTIDAY TOUR RECOMMENDATION TO YOU FOR YOUR STAY. SIMPLY FILL IN THIS FORM AND I WILL REPLY in short order. Please provide the number of full days you expect to be visiting Hong Kong and any other relevant details.